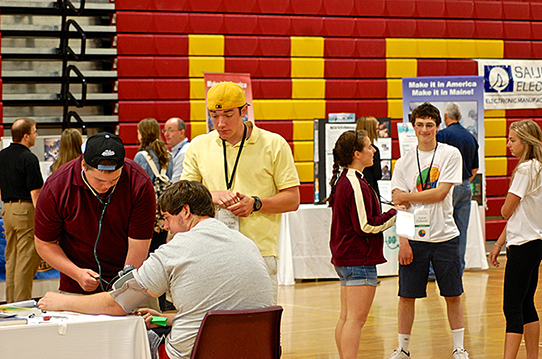 The STEM Fair brought the business community to CEHS for a morning of inspiring talks, hands-on displays and cool demonstrations. CEHS students experienced the work involved in STEM careers. Twenty-eight companies participated, representing the fields of engineering, manufacturing, medicine, finance, chemistry, technology, data management, statistics and math. Faculty members who that made it all happen were Roger Rioux, Courtney Ferrell, Chris Newell, Ginger Raspiller and Evan Thayer. The day was so successful, planning for one in 2015 is already underway.